Home>Welcome Center>Alibaba Cloud Beginners>Can I get a refund? [products]Can I get a refund? Hello everyone, I purchased economy webhosting recently and I am very disappointed from the service I get. I want to close my account and get a refund. My blog already down for 2 days, everything was very easy with "CPANEL" of my previous hosting company. Can I get a refund? I am extremely dissappointed! I have a lot to say but dont want to talk about them. Plase check more information in your ticket, thanks for your understanding. 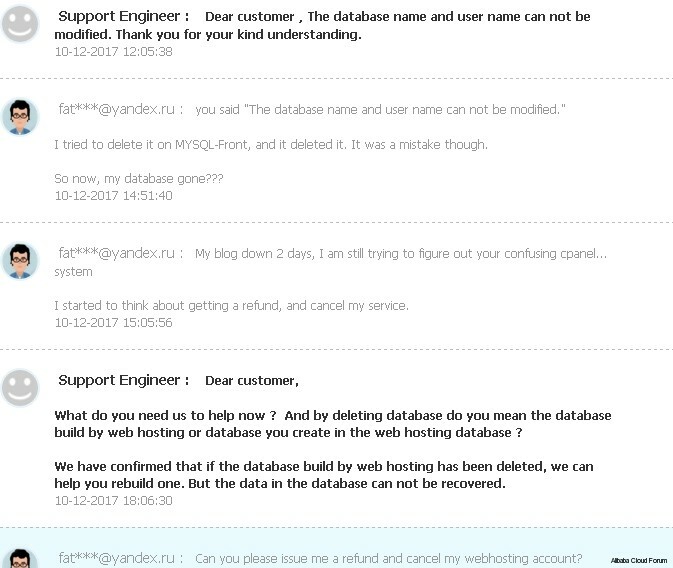 Can you please issue me a refund and cancel my webhosting account? This (screenshot below) is the most arrogant/ignorant reply I have ever seen on any hosting firm I have ever worked! I ordered hosting only 2 days ago, I already stopped service/instance, my website was down for two days! I removed the domain binds! Went back to my old hosting company! My website now up and working again! BEWARE! you can not even change "name of mysql user or name of database" with economy hosting! 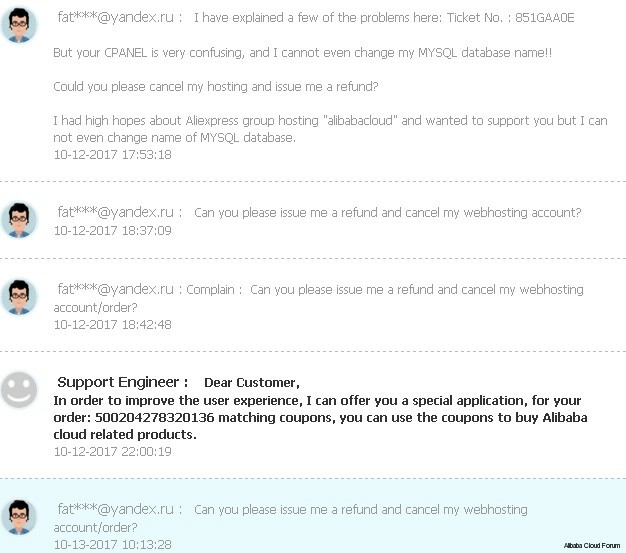 I am telling these guys on support ticket system, the problems I face, they can not understand anything! Now I am telling: "Can you please issue me a refund and cancel my webhosting account/order? " I am in the same situation, except, I purchased the web hosting today, and I havent run anything, created any instances, or other. Alibaba international site does not support refund now, except you purchase service has the quality problem. Thinking of getting a refund too, haven't got any answers to my queries yet.. the guides in the site just shows how to purchase the products, no guides shows how to make the products work..
As I Know, could you please create a ticket in web console? I'm on a VPC and I'm a Full Stack Web Developer and Sys Admin, and can say it's a long learning curve, and doing pretty much everything over SSH, and it's not a pleasant experience with MySQL even when I have full control. Ports have to be opened from the backend and allow InBound connections, and MySQL came pre-loaded on the Instance, although I expected it not to, thus changing the password was real pain, and now MySQL is refusing to start. The System Permissions went corrupt, and when trying to fix them I get Operation not permitted and you carry on. I'm not yet on the Refund bandwagon, yet, but I'm still evaluating their platform, because it's a new thing and very different than any of the one I worked on before like DigitalOcean, OVH, Amazon, Linode and others, so I want to be fair in my judgment. There are few things I didn't buy like Advanced DNS and whatnot, since I could install and configure them manually. CentOS is crap, and sorry for the word. Nothing worked, unlike Ubuntu, came out pretty much smooth. Time now to evaluate the performance. Unfortunately, because I chose to buy Monthly Subscription, stopping and deleting the old Instance doesn't refund the rest of the days -- 29 days! I have faced the same problem.I have purchased the hosting package.But it was a wrong order.Therefore I want to refund the cash. What should I do?